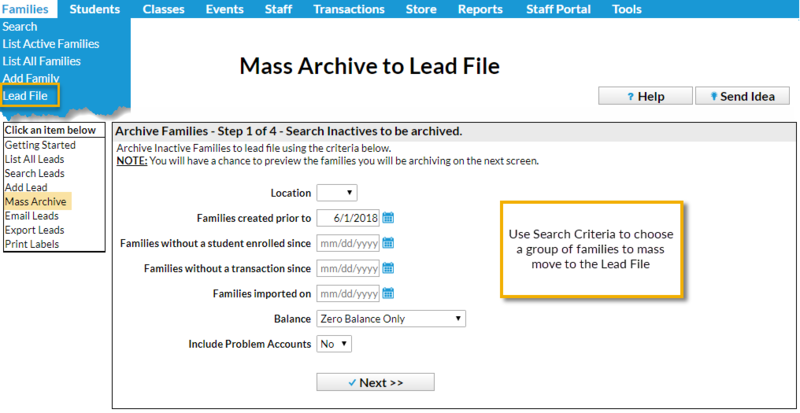 In addition to moving an individual family to the Lead File, Jackrabbit offers the option of moving groups of inactive families to the Lead File based on specific criteria. Families with any Event enrollment within the last 30 days will not be included in the list of families to mass archive. These families can be moved to the lead file individually if needed. Go to Families > Lead File. In the left menu, choose Mass Archive. In the Mass Archive to Lead File pop-up window, select Preview to Archive. Preview the list and check rows/uncheck rows as needed. Only checked family rows will move to the Lead File. Click Export to File to export the data to Excel. This step is not mandatory but is highly recommended. After exporting to Excel, click Perform the Move to the Lead File.